“Victory is won not in miles but in inches. Today I did 100 push-ups– IN A ROW!…well…sort of in a row. There were brief rest periods, but that was only because my arms were turning to jello. None-the-less, breaks or not, 100 push-ups is a milestone worth celebrating in my book! Why? Because I celebrate the small victories in life- and this month in particular, I need all the small victories I can get. So far, I have not written much to acknowledge Domestic Violence Awareness Month (I did however, write a post about Breast Cancer Awareness– somewhat ironically). Perhaps I’ve been avoiding it. I have faced it head-on in terms of charity work and running a half and full marathon to raise awareness. Yet, somehow I haven’t taken any time to focus on it here. October is a difficult month for me. My wedding was October 21st. The day was traumatic, and the two months that followed were even worse as the abuse continued to escalate. Despite the fact that I currently have a happy and productive life -with an amazing network of friends, family, and even work out buddies– when October rolls around I feel more stressed, anxious, and above all sad. As content as I am with my life, I can’t help but feel a sense of loss. I’m still grieving for the naïve part of myself that was rudely awakened to just how cruel and vile some people can be. I didn’t choose to become a different person; it was forced upon me. While I don’t regret what I’ve been through, I do (at times) feel cheated that my view of the world was shattered in such a base and senseless fashion. Perhaps it wasn’t a great idea to schedule my marathon tapering and recovery in the midst of a time when I need running therapy the most; however, I truly believe running the full, grueling 26.2 miles of the marathon was an appropriate tribute to the other victims of abuse. It was a testament to ability of the mind and spirit to endure suffering and overcome a seemingly insurmountable distance. Running in October gave the races extra significance, as well as added motivation for me to finish. All that being said, my first post-marathon run on Monday was AWFUL. I had been itching to go all week and thought I had enough time to recover (I know, being sick all week probably shouldn’t count as recovery time!). Unfortunately, my body didn’t agree. My knees were bugging me from step number one, and my legs felt like lead. It was the marathon all over again! I couldn’t believe I was still having issues (and, no, I shouldn’t have been surprised). I tried to enjoy Penny’s company instead of being frustrated. She wasn’t paying any attention to my internal struggles. Instead, she spent her time rolling in every muddy puddle she could find until she finally emerged looking (and smelling) like the swamp thing. 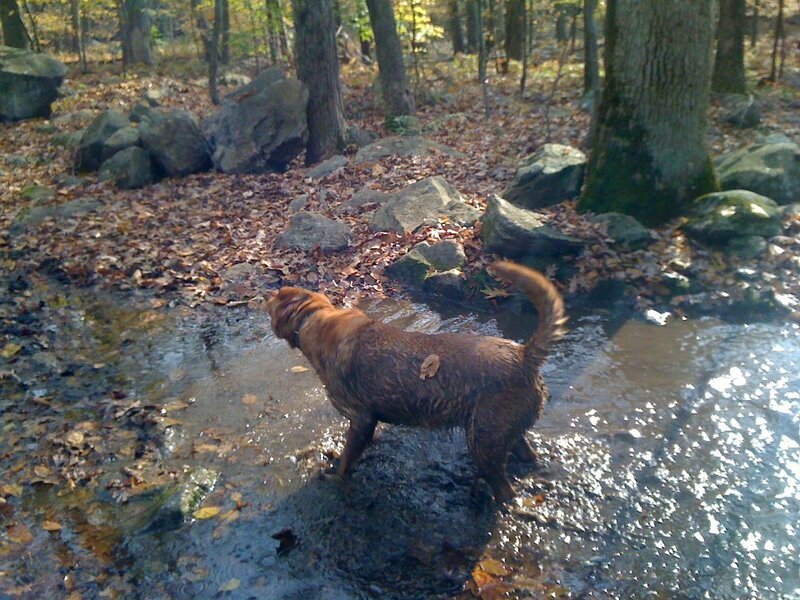 Once sufficiently covered in mud, leaves, and-who-knows-what else she would return back to running up ahead and beckoning for me to chase after her. We ran and hiked for about an hour; and then, much to her chagrin, I brought her home and gave her a bath. At boot camp that night, I continued to drag and felt crummy. I was feeling sick and frustrated with my body for being achy and uncooperative. Given that I am still feeling under the weather, I was somewhat dreading going back tonight. I didn’t want to go through another work out unable to do my best. I HATE being held back for any reason- sick, injured, etc. That is why I am EXTRA happy to have FINALLY had a good work out day. LOL I didn’t even have any knee trouble- despite all the running. We did sprints with 100 reps of 10 different exercises in between (YES- Another infamous 1000 rep workout). The exercises included jumping jacks, one-handed mountain climbers (that’s right one-handed, because we are hard-core! ), crunches, skaters, power jacks, crab toe touches, low plank obliques, heismans, power jumps (I may hate these more than psuh-ups), and then finally PUSH-UPS. It was not that long ago that I couldn’t manage ONE real push-up (NO “girlie” push-ups allowed at boot camp!). Today I did 100. Take that PTSD October stress!!!! I am going to own you this time around! I think October was a great time to run your first marathon – showing your ex how strong you are without him. And 100 pushups – wow! 100 push ups? I must be the running skiver. I can only manage 10% of that, jelly arms and all. Good work! Thanks! If I can do it, I’m sure anyone can. It just takes a little practice and determination. My name is Tony I’m in England and I just ran the Eden Project Half Marathon and pushing on for next year’s London Marathon in April. However I am NOT writing asking for sponshorship money I promise! I’m just writing to you because I also blog and would like to meet more people like you and make new friends and share etc. How would you feel about us adding each other’s blogs to our respective blogroll’s? I would love to meet more people on wordpress and share stuff. I hope we can follow each other’s blog? I have absolutely no other agenda, I am not a spammer or a trying to promote any kind of product or business I promise! I’m just a jogger in the Uk looking to make more friends across the ether. Congrats on your half! I am glad you stopped by. I will definitely check out your blog. You are awesome in many ways! I think you are pretty awesome yourself. I think 100 push ups is amazing! Congratulations!! And good for you for taking charge of your feelings and finding a way to feel good! That is freaking awesome!!!! You go girlie! You don’t just own it- you crushed it! 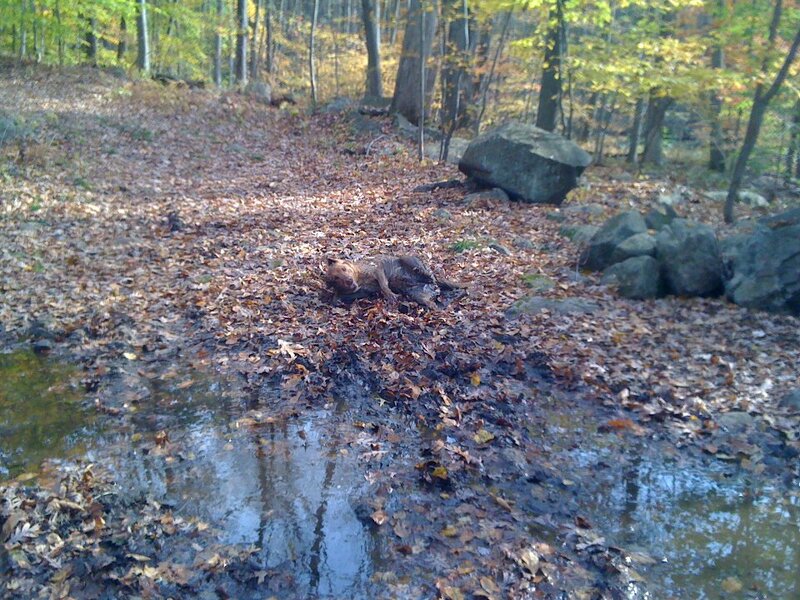 Oh yeah…I can’t do more than a few guy’s pushups…I need to work on that and my dog is like your’s…he loves to roll in the mud puddles on the trail when I run! Love the pictures of your dog!